Fluorescent dyes with biocompatible functional group and good fluorescence behavior are used as biosensor for monitoring different biological processes as well as detection of protein assay. All reported fluorophore used as sensors are having high selectivity and sensitivity but till there is more demand to synthesized new fluorophore which have improved fluorescence properties and good biocompatibility. Novel 4, 4'-(1, 1'-(5-(2-methoxyphenoxy)-[2, 2'-bipyrimidine]-4, 6-diyl)bis(1H-pyrazol-3, 1-diyl)) dianiline fluorescent dye was synthesized by multistep synthesis from 2-phenylacetonitrile, 2-chloropyrimidine and 2-methoxyphenol. This dye has absorption at 379 nm with intense single emission at 497 nm having fairly good quantum yield (0.375) and Stokes shift. The intermediates and dye were characterized by FT-IR, 1H NMR, 13C NMR and Mass spectral analysis. The pyrazole bipyrimidine based fluorescent dye possessing two amino groups suitable for binding with protein is reported. Its utility as a biocompatible conjugate was explained by conjugation with bovine serum albumin. The method is based on direct fluorescence detection of fluorophore-labelled protein before and after conjugation. Purified fluorescent conjugate was subsequently analyzed by fluorimetry. The analysis showed that the tested conjugation reaction yielded fluorescent conjugates of the dye through carbodiimide chemistry. In summery synthesized fluorophore pyrazole-bipyrimidine has very good interaction towards protein bovine serum albumin and it acts as good candidate for protein assay. Protein recognition by synthetic molecules is a challenging endeavour, since these materials must bind to a large relatively flat surface domain and recognize a unique distribution of amino acid residues of varying charge, size and shape . Identification and quantification of specific proteins is an important issue in medical and clinical research as many diseases have a specific change in protein expression [2–5]. The most commonly used technique in clinics is enzyme-linked immunosorbent assay (ELISA), which requires specific storage of active enzymes and tedious protein modification . Different strategies have been developed to simplify the detection procedure, which involve specific metal coordination, epitope-docking on miniature proteins, aptamer selection, non-natural peptide isosteres, functionalized platforms, secondary structure mimetics, molecular imprinting and receptors embedded in lipid layers. Recognition of protein binding or change in the structure is detected with the help of fluorescence , electrochemistry , Raman spectroscopy , chemiluminescence , flow cytometry  and micro fluidic methods . However, most of these methods require sophisticated instrumentation and proficient manipulation, which highly motivated the development of simple and reliable protein detection systems. In general, the preferred fluorescent labels should have high fluorescence quantum yields and retain the biological activities of the parent unlabeled biomolecules. A fluorescent dye can be attached to a peptide at a specific point through a covalent bond depending on the sequence of peptide. The linkage between dye and peptide is a covalent bond, which is stable and not destructive under most biological conditions. In some cases, a functional linker is introduced between dye and peptide to minimize the alteration of peptide biological activity. For all the peptide labeling, the dye needs to be attached at a defined position: N-terminus, C-terminus, or in the middle of a sequence. Several fluorescence probes have been reported in the literature to investigate biological process through fluorescence measurements [13–15]. For use as reporter molecules in biological systems many organic dyes have been studied, like coumarin derivatives , fluorescein isothiocyanates [17, 18], anthracene derivatives  and β-naphthol . Amine-containing dyes are used to modify peptides using water-soluble carbodiimides (such as EDC) to convert the carboxy groups of the peptides into amide groups. Either NHS or NHSS may be used to improve the coupling efficiency of EDC-mediated protein-carboxylic acid conjugations. A large excess of the amine-containing dyes is usually used for EDC-mediated bioconjugations in concentrated large peptide solutions at low pH to reduce intra- and inter-protein coupling residues, a common side reaction. The spectral changes observed on the binding of fluorophores with proteins are an important tool for the investigations of the topology of binding sites, conformational changes and characterization of substrate to ligand binding. Besides, determination of protein quantity in biological liquids is of great importance in biology and medicine and fluorescent probes are successfully applied for this approach . As a part of our ongoing research to develop novel materials for high tech applications [22–24], here we report the synthesis, characterization and photophysical properties of a novel fluorescent biocompatible fluorescent probe for protein assay having a pyrazole bipyrimidine framework. The novel fluorophore was prepared by multistep synthesis from 2-chloropyrimidine, phenylacetonitrile and 2-methoxyphenol. Z-2-(4'-Nitrophenyl)-3-hydroxypropenal 5 was prepared form phenylacetonitrile by nitration, hydrolysis followed by Vilsmeier Hacck formylation. The amidine 8 was prepared in two steps from 2-chloropyrimidine 6. Reaction of dimethyl chloromalonate 10 with guaiacol 9 afforded malonate 11. Pyrimidinedione 12 was then constructed via an amidine 8 and malanoate 11 condensation. The pyrimidinedione 12 was converted to the dichloropyrimidine 13 with phosphorous oxychloride, reaction of hydrazine hydrate with dichloropyrimidine 13 yielded the desired 4, 6-dihydrazinyl-5-(2-methoxyphenoxy)-2, 2'-bipyrimidine 14. Intermediate 4, 6-dihydrazinyl-5-(2-methoxyphenoxy)-2, 2'-bipyrimidine 14 reacted with an intermediate Z-2-(4'-nitrophenyl)-3-hydroxypropenal 5 which was prepared from phenyl acetonitrile through multistep process yielded 5-(2-methoxyphenoxy)-4, 6-bis(3-)4-nitrophenyl)-1H-pyrazole-1-yl)-2, 2'-bipyrimidine fluorophore 15 contains nitro group which is not biocompatible. The basic requirements for fluorophore to be good candidate are that it should contain biocompatible group for binding, high photostability with good quantum yield. 5-(2-Methoxyphenoxy)-4, 6-bis(3-)4-nitrophenyl)-1H-pyrazole-1-yl)-2, 2'-bipyrimidine 15 was further reduced to 4, 4'-(1, 1'-(5-(2-methoxyphenoxy)-[2, 2'-bipyrimidine]-4, 6-diyl)bis(1H-pyrazole-3, 1-diyl)) dianiline 16 by using Pd/C and hydrazine hydrate as shown in Scheme 1. The structure of the compounds was confirmed by FT-IR, 1H NMR and Mass spectral analysis. Synthesis of 4, 4'-(1, 1'-(5-(2-methoxyphenoxy)-[2, 2'-bipyrimidine]-4, 6-diyl)bis( 1H -pyrazole-3, 1-diyl)) dianiline. The synthesized novel heterocyclic dye 16 is fluorescent in solution when irradiated with UV-light and framework contain biocompatible free amino groups which were further explored for labelling with protein bovine serum albumin. The dye had absorption at 379 nm accompanied by intense single emission in the range 497 nm with good quantum yield (0.375). The dye was conjugated with protein bovine serum albumin (BSA) through carbodiimide chemistry between the surface terminated negatively charged carboxylate groups (-COO-) of protein and the positively charged amino groups (-NH3+) of the fluorophore. This interaction between functionalized amino groups with protein molecule was investigated using fluorescence spectroscopy showing the fluorescence quenching of the fluorophore after the conjugation with protein which is due to covalent bond formation between carboxylate group of protein and amino group of fluorophore. In order to warrant an efficacious label the unbound fluorophore was efficiently removed from unconjugated one by dialysis in phosphate buffer solution at pH 7. Conjugation of fluophore with protein was analyzed by using fluorescence emission analysis. Fluorescence study showed that novel fluorescent compound has very good interaction towards the biomolecules. An effective fluorescent dye for biological application has to present a good fluorescent intensity, high quantum yield and high photostability. Quantum yield of dye 16 was determined by using anthracene as standard. The absorption and emission characteristic of standard as well as compound 16 were measured at different concentration (2, 4, 6, 8 and 10 ppm level). Absorbance intensity values were plotted against emission intensity values, a linear plot was obtained. Gradients were calculated for dye 16 and for standard. All the measurements were done by keeping the parameters constant such as same solvent and constant slit width. Relative quantum yield of dye 16 was calculated by using Formula 1. Gradient of standard (Additional file 1) and gradient of unknown (Additional file 1) was calculated for quantum yield calculation of novel compound 16 is described in Table 1 respectively. By putting value of gradients in Formula 1, quantum yield were calculated for dye by taking anthracene as standard (Quantum yield of anthracene in ethanol solution is 0.270). Quantum yield of the dye in ethanol is 0.375. Binding of dye 16 with protein was confirmed by change in the fluorescence wavelength before and after conjugation. Observed difference between fluorescence emission after conjugation and before conjugation is 30 nm. Measurement was performed at very low concentration of dye (0.001, 10 ppm concentration) Figure 1. 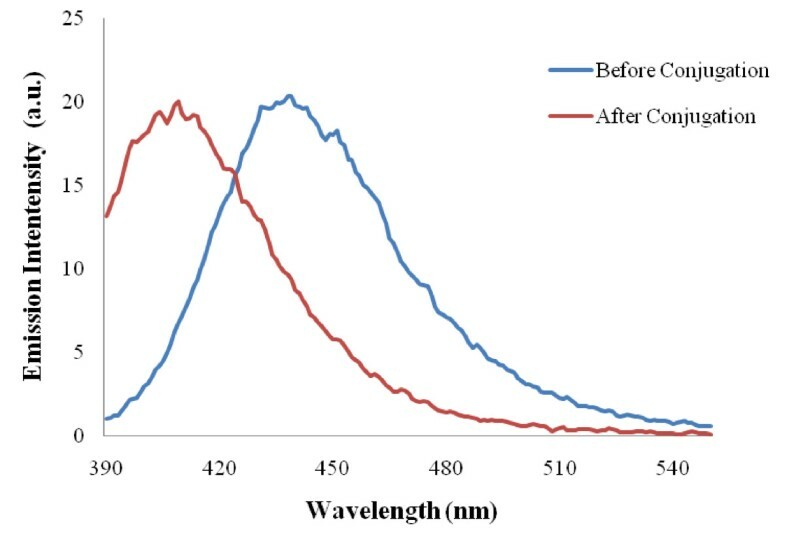 The change in emission wavelength after conjugation is due to formation of covalent linkage between carboxy group of protein and amino group of dye. Fluorescence emission of dye before and after binding with protein BSA. This dye 16 was proposed to bind with carboxylate group on protein surface. Accordingly, the binding number of dye per protein molecules depends on the accessible number of carboxylate groups on each type of protein. The conjugation extent of bovine serum albumin with fluorophore 16 at various concentration of dye was studied. The amount of dye bound to protein increased gradually as the dye concentration increased from 0.001 to 0.01. At higher dye concentrations the fluorescence intensity became steady, probably due to saturated binding between dye and protein Figure 2. Fluorescence emission of fluorophore 16 before and after conjugation with protein bovine serum albumin (BSA) with various amount of dye. 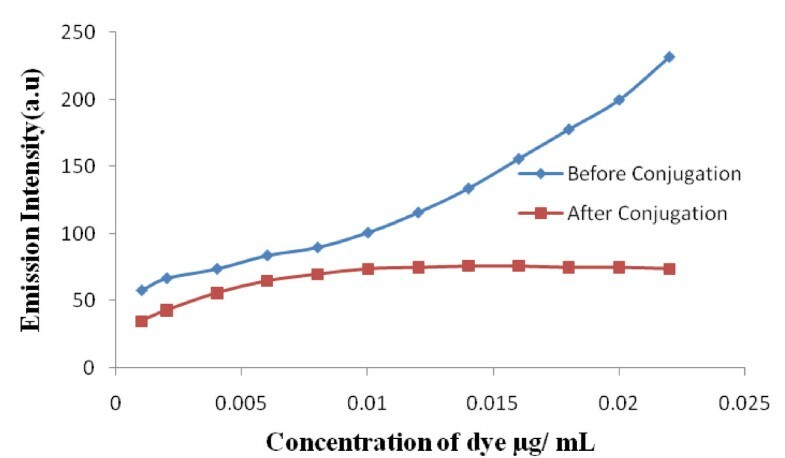 Fluorescence emission properties of conjugated dye-protein were also studied by varying the amount of protein by keeping dye concentration constant. 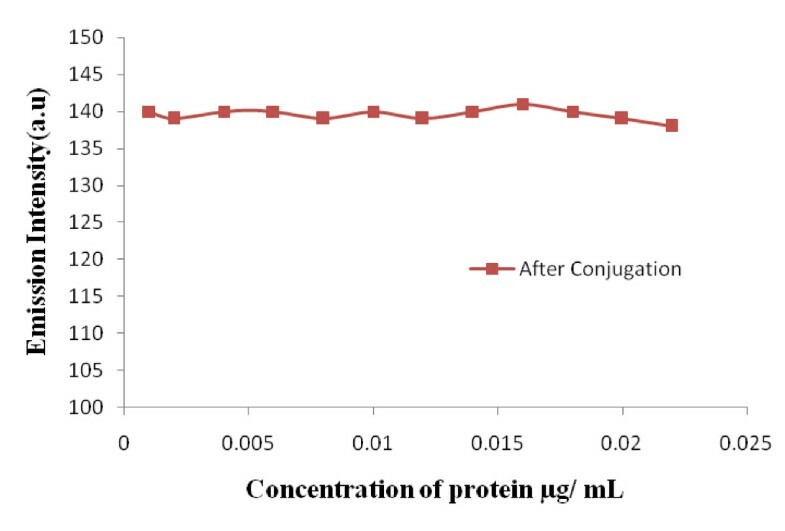 It was observed that there is no change in emission intensity of dye-protein conjugate at various protein concentrations Figure 3. Fluorescence emission of fluorophore 16 before and after conjugation with protein with various amount of protein. All commercial reagents and solvents were purchased from s d fine chemicals (India) and were used without purification. Bovine Serum Albumin (BSA) was purchased from Sigma Aldrich. Column chromatography was performed using silica gel 60-120 mesh size. The reaction was monitored by TLC using on 0.25 mm E-Merck silica gel 60 F254 precoated plates, which were visualized with UV light. The FT-IR spectra were recorded on Perkins-Elmer 257 spectrometer using KBr discs. 1H NMR and 13C NMR spectra were recorded on VARIAN 400 MHz and 100 MHz instrument using TMS as an internal standard. Mass spectra were recorded on Finnigan mass spectrometer. The visible absorption spectra of the compounds were recorded on a Spectronic Genesys 2 UV-Visible spectrometer. Fluorescence emission analysis and quantum yield were carried out on Cary-Eclipse fluorescence spectrophotometer (Varian, Australia). Absorption spectra were measured at room temperature on a Perkin Spectronic Genesys 2 UV-Visible spectrophotometer. Absorption maxima were recorded with an accuracy of 0.5 nm. Emission spectra of the dyes and dye-BSA were measured at room temperature on a Varian Cary Eclipse spectrofluorometer in a standard 1 cm quartz cell. All dyes were excited with an excitation slit width of 5 nm and emission slit width of 5 nm. The spectra were corrected. All concentrations of the fluorophores were chosen to be between 0.001 and 0.022 μM. Protein binding reactions were carried out using coupling reagent N-hydroxy succinamide (NHS) and 1-ethyl-3-[3-dimethylaminopropyl] carbodiimide hydrochloride (EDC). A stock solution of 2 mg dye was prepared in 1 ml DMF and 9 mL water. Various amounts of dye from the stock solution were used for protein binding at room temperature. To a solution of protein, excess of N-hydroxy succinamide and 1-ethyl-3-[3-dimethylaminopropyl] carbodiimide hydrochloride was added and mixture shake on shaker (150 rpm) at room temperature for 12 h. After activation of protein, different concentration of fluorophore 16 in dimethyl formamide: water was added in activated protein at room temperature for binding of protein and stirred for 12 h (Figure 4). After 12 h, labelled protein was separated from free fluorophore by dialysis technique (Additional file 1), labelled protein contain fluorophore was dialyzed in phosphate buffer (pH: 7) to separate out unconjugated fluorophore from conjugated one. Dialyzed labelled protein was further analyzed by using fluorescence spectrophotometry to confirmed binding of fluorophore with protein bovine serum albumin. Activation of protein for binding. A mixture of concentrated nitric acid (specific gravity 1.42) (138 mL, 2.15 mol) was cooled to 0-10°C and 2-phenylacetonitrile 1 (50 g, 0.425 mol) was added to it at such a rate that the temperature remained at about 10°C and did not exceed 20°C during the addition. After the addition of 2-phenylacetonitrile the ice bath was removed and the reaction mixture was warmed at 40°C for 2 h. Reaction mass was poured on crushed ice (500 g), a yellow solid separated. The solid was filtered, washed separately with ice-cold water to remove the traces of acid and dried to yield 2. Yield: 55 g, 79%; m.p. : 114°C (115-116°C lit ). 4-Nitrophenylacetonitrile 2 (50 g, 0.31 mol) was added in 50% H2SO4 (300 mL). The reaction mixture was refluxed for 30 min, diluted with 150 mL of water and cooled to 0°C when a colourless crystalline solid separated. The solid was filtered off, washed with ice-cold water to remove the traces of acid and dried to yield 3. Yield: 53 g, 95%; m.p.150°C (151-152°C lit ). To a vigorously stirred solution of DMF (2.9 mL) at 0°C, POCl3 (2.8 mL, 0.030 mol) was added dropwise. After 5 min, the 4-nitrophenylacetic acid 7 (1.81 g, 0.01 mol) in solution in DMF (5 mL) was carefully added. The reaction mixture was warmed to 70°C for 12 h and then poured on crushed ice 10 g, after neutralization by K2CO3, a solution of 50% NaOH (12 mL) was added and a precipitate was obtained upon cooling at 0°C. The precipitate was dissolved in dichloromethane and recrystallized from diethyl ether to give yellow powder 4. 1 H NMR (400 MHz) δ (ppm): 2.87 (s, 6H, HN (CH3)2), 6.97 (s, 1H), 7.35-7.38 (d, 2H, J = 8.7 Hz, Ar-H), 8.19-8.22 (d, 2H, J = 8.7 Hz, Ar-H), 9.12 (s, H, CHO). 33% aq. NaOH (20 mL) was added to a solution of Z-2-(4'-nitrophenyl)-3-N, N-dimethylaminopropenal 4 (2.2 g, 0.01 mol) in ethanol (20 mL) and the reaction mixture was stirred at reflux for 3 h. Ethanol was removed under reduced pressure and the residue was cooled down with ice to give a precipitate which was filtered and washed with CH2Cl2, this residue was then taken in water and acidified by 6 N HCl to give precipitate, the solid was dissolved in acetone and recrystallized from ether to give a light brown powder 5. 1 H NMR (400 MHz) δ (ppm): 7.82-7.85 (d, 2H, J = 8.8 Hz, Ar-H), 8.18-8.23 (d, 2H, J = 8.8 Hz, Ar-H), 8.64 (s, 2H, CHO), 14.45 (s, 1H, OH). A solution of 2-cyanopyrimidine (4.0 g, 0.038 mol) in 7N ammonia in methanol (300 mL) was stirred at room temperature for 48 h. The reaction mass was allowed to a temperature of 25-30°C and treated with acetic acid (4.2 g, 0.040 mol) to yield 2-amidinopyrimidinium acetate (II). The mixture was rotary evaporated to dryness . 2-Methoxyphenol 9 (25 g, 0.20 mol) and dimethyl chloromalonate 10 (37 g, 0.22 mol) were added dropwise succession to a sodium methoxide solution in 150 mL of methanol and 4.6 g of sodium. The suspension was stirred at 45°C for 1 h in inert atmosphere, thereafter the methanol was distilled off. The residue was taken up in 200 mL of toluene and washed with water. Gave several washing of 1% sodium hydroxide solution and water until the organic phase was colourless. After drying and evaporating the solvent, the residue was distilled. There were 39.5 g of dimethyl (o-methoxyphenoxy) malonate 11 was obtained. Pyrimidine-2-carboximidamide acetate 8 (5.5 g, 0.045 mol) prepared from 2-chloropyrimidine and dimethyl (2-methoxyphenoxy) malonate 11 (2.7 g, 0.01 mol) was heated in acetic acid for 5 h, After completion of reaction, reaction mass poured in ice-cold water, buff white colored product separated and it was recrystallized from ethanol to gave pure 12. FT-IR (KBr) υ max. : 1176 (-O-), 1386, 1563 (C = C), 1723 (C = O), 3271 (NH) cm-1. 1 H NMR (400 MHz, DMSO-d 6 ) (δ: ppm): 3.81 (s, 3H, - OCH3), 6.67 (dd, 1H, J = 1.5, 6.4 Hz, Ar-H), 6.77 (d, 1H, J = 1.5, 5.9 Hz, Ar-H), 6.91 (d, 1H, J = 1.5, 6.0 Hz, Ar-H), 7.00 (dd, 1H, J = 1.5, 6.4 Hz, Ar-H), 7.70 (dd, 1H, J = 6.0 Hz, Ar-H), 9.01 (m, 1H, J = 5.0 Hz, Ar-H), 12.39 (s, 1H, NH). 13 C NMR (100 MHz, DMSO-d 6,) (δ: ppm): 55.8, 112.9, 113.3, 120.6, 121.3, 122.0 123.1, 146.6, 148.5, 149.4, 156.9, 158.2, 160.1. Mass: m/e = 313.1 (M + 1). A mixture of 5-(2-methoxyphenoxy)-6-hydroxy-4 (3H)-pyrimidinone 12 (150.0 g, 0.48 mol) and phosphorus oxychloride (290 g, 176 mL 1.89 mol) was heated to 90°C. After the vigorous gas evolution subsided, the pot temperature was increased to 105°C and maintained for 5 h. The mixture was cooled to 80-90°C, diluted with 225 mL of toluene and then added to a mixture of 675 mL of toluene and 525 mL of water over 30 min. Aqueous sodium hydroxide (400 mL of 30%) was added at 70-80°C, and then the layers were separated. Toluene layer was washed with 500 mL of water containing 10 mL of 30% aqueous NaOH, toluene layer was concentrate to dryness to afford 220 g of buff white product 13. FT-IR (KBr): 751, 811, 1112, 1253, 1386, 1499, 1563 cm-1. 1 H NMR (400 MHz, DMSO-d 6 ) (δ: ppm): 3.84 (s, 3H, -OCH3), 6.83 (d, 1H, J = 1.8 Hz, Ar-H), 6.94-6.96 (t, 1H, J = 1.5 Hz, Ar H), 7.15 - 7.18 (d, 2H, J = 1.5, 5.5 Hz, Ar-H), 7.68-7.72 (d, 1H, J = 5.5 Hz, Ar H), 9.05 (m, 1H, J = 5.5 Hz). 13 C NMR (100 MHz, DMSO-d 6 ) (δ: ppm): 56.1, 113.6, 115.8, 121.0, 122.6, 124.7, 143.5, 144.7, 148.7, 154.7, 157.0, 158.3, 159.9. Mass: m/e 351.1(M + 2). A mixture of 4, 6-dichloro-5(2-methoxyphenoxy)-2, 2'-bipyridine 13 (2 g, 0.0067 mol), hydrazine hydrate (0.65 g, 0.013 mol) and ethanol (20 mL) was refluxed for 1 h, cooled, filtered and washed with ethanol to yield 14. FT-IR (KBr) υ max: 750, 831, 1110, 1256, 1396, 1500, 1560, 2904, 3306, 3396 (-NH2) cm-1. 1 H NMR (400 MHz, DMSO-d 6 ) (δ: ppm): 3.34 (s, 3H, -OCH3), 5.36 (s, 2H, NH), 6.60-6.63 (d, 1H, J = 8.4 Hz, Ar H), 7.34-7.40 (d, 4H, -NH2), 7.48-7.50 (d, 2H, J = 7.4 Hz, Ar-H), 7.72-7.75 (d, 2H, J = 8.8 Hz, Ar H). Mass: m/e 341(M + 1). A mixture of 4, 6-dihydrazinyl-5-(2-methoxyphenoxy)-2, 2'-bipyrimidine 14 (3.86 g, 0.02 mol), Z-2-(4'-nitrophenyl)-3-hydroxypropenals 5 (2.98 g, 0.01 mol) and ethanol (40 mL) was refluxed for 3 h, cooled and poured into ice water (100 mL) to yield crude 15 which was crystallized from ethanol to yield pure 15. FT-IR (KBr): 748, 852, 959, 1100, 1173, 1254, 1333 (-NO2), 1393, 1500, 1529, 1601 cm-1. 1 H NMR (400 MHz, DMSO-d 6 ) (δ: ppm): 3.84 (s, 3H, -OCH3), 6.77-6.88 (t, 2H, J = 7.2, 7.8 Hz, Ar H), 6.88 (d, 1H, J = 8.2 Hz), 7.01 (t, 2H, J = 7.8 Hz), 7.09 (d, 1H, J = 7.8 Hz), 7.74 (t, 1H, J = 5.0 Hz), 8.00 (d, 3H, J = 8.7 Hz), 8.24-8.27 (d, 3H, J = 8.8 Hz, Ar-H), 8.47 (s, 2H, Ar-H), 9.09-9.11 (d, 1H, J = 4.8 Hz, Ar-H), 9.19 (s, 1H, Ar-H). Mass: m/e = 655 (M + 1). Palladium-carbon catalyst (0.036 g) (10%) was added portion-wise during 5-10 min to a hot solution of 15 (2.0 g, 0.003 mol) in ethanol (50 mL) containing hydrazine hydrate (1.16 g 0.023 mol). The mixture was heated under reflux for 1 h. The hot solution was filtered through a Whatman paper to remove Pd and further filtrate was filtered through silica gel (10 g) and the solvent was evaporated to offered pure product 16 and recrystallized from ethanol. FT-IR (KBr): 749, 852, 9017, 1109, 1163, 1249, 1496, 1561, 2966, 3174 (-NH2) cm-1 . 1 H NMR (400 MHz, DMSO d 6 , D 2 O Exchange) (δ: ppm): 3.85 (s, 3H, -OCH3), 6.57-6.59 (d, 2H, J = 7.8 Hz, Ar-H), 6.69-6.71 (t, 2H, J = 6.3 Hz, Ar-H), 6.90-6.92 (t, 2H, J = 7.3 Hz, Ar-H) 7.04 (d, 1H, J = 7.8 Hz, Ar-H), 7.65-7.68 (t, 1H, J = 5.0 Hz, Ar-H), 7.81-7.89 (dd, 4H, J = 8.8, Ar-H), 8.19-8.27 (dd, 4H, J = 3.4, 5.4, 6.8 Hz, Ar-H), 8.91 (d, 1H), 9.02-9.03 (d, 2H, Ar-H). Mass: m/e = 595.6 (M + 1). In summary, synthesized fluorescent pyrazole bipyrimidine has very good binding interaction with bovine serum albumin. The method is based on the direct fluorescence detection of protein-labelled with triazine fluorophores after dialysis. The more evident fluorescent signal was obtained at very little concentration of fluorophore and easily detectable in near visible region which indicates an important application for this compound as fluorophores for protein assay. Authors are thankful to Indian Institute of Technology, Mumbai for NMR and Mass spectral analysis. VSP contributed for synthesis and spectral analysis under the guidance NS; VSP and VSP contributed bioconjugation study and photophysical study under the guidance NS. All the authors read and approved the final manuscript.